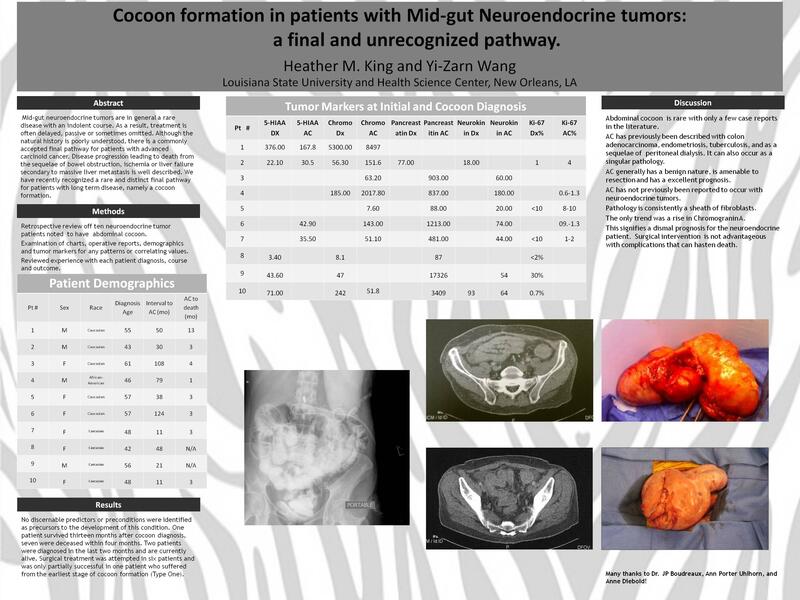 Cocoon Formation in Patients With Mid-Gut Neuroendocrine Tumors-A Rare and Unrecognized Final Pathway. Introduction: Mid-gut neuroendocrine tumors are in general a rare disease with an indolent course. As a result, treatment is often delayed, passive or sometimes omitted. Although the natural history is poorly understood, there is a commonly accepted final pathway for patients with advanced carcinoid cancer. Disease progression leading to death from the sequelae of bowel obstruction, ischemia or liver failure secondary to massive liver metastasis is well described. We have recently recognized a rare and distinct final pathway for patients with long term disease, namely a cocoon formation. Method: Seven patients in our center developed this rare condition in the last three years. Patients’ charts, operative reports, lab results, pathology and tumor markers were reviewed in an attempt to recognize any common denominator. We will also discuss our dismal experience in attempts to intervene or halt disease progression, the results and outcome. Results: No reliable predictor or precondition leading to the development of this condition was identified. Surgical treatment is only partially successful in dealing with these patients, namely those with a Type 1 cocoon. We propose that an advanced form of cocoon encasing the entire abdominal contents be included in the subtype 4. Conclusion: Cocoon formation in long term NET survivors is a rare but lethal terminal disease progression that was not previously recognized or reported. The best treatment is yet to be discovered. Currently, the best approach is to recognize the condition preoperatively if possible and treat expectantly. In contrast to cocoon patients without NETS, surgical treatment is not advisable with the exception of patients with Type 1 abdominal cocoon.